Rogers Centre, originally known as SkyDome is a multi-purpose stadium in downtown Toronto, Ontario, Canada situated next to the CN Tower near the shores of Lake Ontario. Opened in 1989 on the former Railway Lands, it is home to the Toronto Blue Jays of Major League Baseball and the Toronto Argonauts of the Canadian Football League. 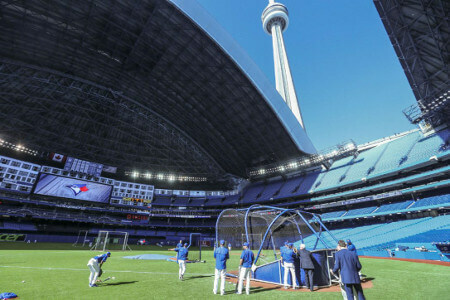 The stadium was renamed “Rogers Centre” following the purchase of the stadium by Rogers Communications, which also bought the Toronto Blue Jays, in 2005, but is still colloquially referred to as the Skydome.